This use is straightforwardly causative — to endow is ‘to cause to have’ — like the bulk of examples of the derivational suffix –ize in English. The incredibly versatile derivational suffix –ize: my 9/30/11 posting “The velocitized Toad” has tons of examples, but not anthropomorphize. In mythology, folklore and speculative fiction, shapeshifting (or metamorphosis) is the ability of a being or creature to completely transform its physical form or shape. This is usually achieved through an inherent ability of a mythological creature, divine intervention, or the use of magic. … The most common form of shapeshifting myths is that of therianthropy, which is the transformation of a human being into an animal or conversely, of an animal into human form. Legends allow for transformations into plants and objects, and the assumption of another human countenance (e.g. fair to ugly). The woman in #1 is apparently the agent of the dog’s change, into a creature that wears a shirt, coat, and tie; sits in a chair like a human being; and drinks coffee. Many cartoons have them — some animation companies have made their entire core casts out of them. 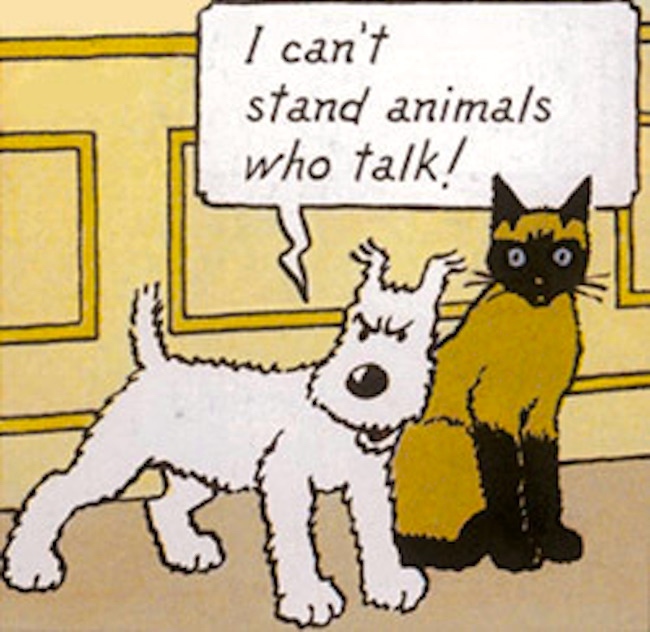 Very simply, these are animals who talk. They are a lot better at it than the Speech-Impaired Animal. They can easily hold down a conversation with human members of the cast. It’s not like every human Speaks Fluent Animal either; the animals themselves are able to talk and that’s just the way it is. Despite their ability to speak, they are still animals in almost every other way, particularly when it comes to instincts, priorities and motivations. They very rarely wear clothes, and they are often vocally proud of the fact they aren’t human. They may even choose to talk to no one but a single human, who typically finds this very disturbing. They may even break the Fourth Wall and talk only to the viewer. A Civilized Animal: who is an animal that shows some form of civilized manner and generally has half the mannerisms of a human, but otherwise occupy their species’s natural role and have the basic body shape of their species. A Funny Animal: who has more than half, most, or almost all of the mannerisms of a human being, but still have the basic body shape of their species. A Petting Zoo Person: who is an animal that has almost all, if not all, of the mannerisms of a human being and actually has a human body frame. A good comparison: Ralph the mouse (from The Mouse and the Motorcycle) is a Talking Animal; he lives in a mousehole, dodges cats, and runs around naked (save for his fur), yet he enjoys motorcycles and regularly talks to the human boy Keith. Mickey Mouse is a Funny Animal; he lives in a house, drives a car, wears clothing, and sprays his garden with pesticides (think about that for a second). Like many Speech Impaired Animals and Nearly Normal Animals, many Talking Animals lack hands and walk on all fours, negating the possibility of performing many human tasks and behaviors. A few examples are bipedal even if their species isn’t naturally so. However, when required by a joke, the Talking Animal can sometimes act like the more anthropomorphic Civilized Animal or Funny Animal. This entry was posted on August 23, 2017 at 6:44 pm and is filed under Derivation, Linguistics in the comics, Morphology, Verbing. You can follow any responses to this entry through the RSS 2.0 feed. You can leave a response, or trackback from your own site. 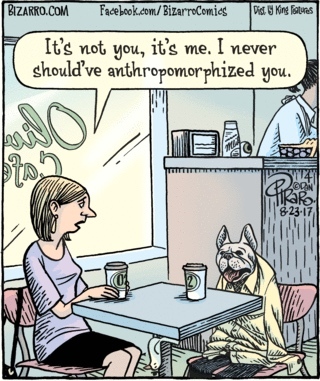 My interpretation of the cartoon is, I think, slightly different: that somehow, by anthropomorphizing the dog in the conventional sense (by talking to and about it as if it were human), she has caused it to acquire human characteristics and/or practices.